Regular nail clipping is often required for elderly and indoor pets as they do not naturally wear down their nails. The level and frequency of trimming required can vary upon breed, age, exercise and the environment in which you pet is kept. Working breeds of dogs are active and generally have compact feet with well arched toes that angle the toenails downwards towards the ground. If these dogs are active on hard surfaces such as gravel, rock and concrete, their nails may not need trimming until they slow down with age and exercise less, however you will still need to attend to their dew claws regularly. Other breeds may have nails that grow more forward than downward, and therefore no matter how much exercise they get on rough ground, it is unlikely they will wear down naturally. Some dogs may benefit from having the tips of their nails taken off once every week or two, however for most it will be longer than this. You will have to decide what is right for your dog by inspecting its nails on a regular basis. Certainly if you notice a change in the sound of your dog's nails on hard floors this is a pretty good indication that it is time for a trim. We also offer nail trims for birds, ferrets and guinea pigs. If a pet's nails are allowed to grow to long, they can split, break or bleed, causing soreness or infection in your pet’s feet and toes. Long nails can get caught and tear, or grow so long that they can curl backwards into a spiral shape that can make walking very painful for dogs (it's like walking in shoes that are too small). Cats are able to retract their claws so this is less common for them, however,cats do still need to have their nails regularly clipped (especially if they don't get much natural wear and tear). Uncut nails may curl so far that they pierce the paw pad, leading to infection and debilitating pain. Nails should be inspected and/or trimmed on at least a monthly basis. If not, the quick tends to grow out with the nail, making it nearly impossible to cut properly. It is very important not to cut the quick of a nail as this is rich in nerve endings and very painful for the pet. If you do accidentally cut into the quick, pressing the nail into a bar of soap will effectively stop the bleeding. Make an appointment today on 7231 3000 to have your pet’s nails checked. 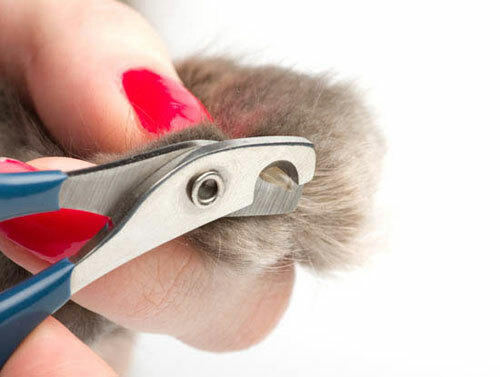 We have a variety of nail clippers that suit different pets from the very small to the very tall. We can also teach you how to check and cut them yourself if you would prefer.